Make those run-of-the-mill cigar cases stand out. Have your leather cases imprinted, either for a special occasion, with your store name, or even for a special customer. Blind embossed printing, or gold, silver, or any standard printer's matching color ink is available. Reasonable printing charges for as few as 50 pieces. 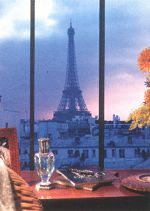 Club Imports, San Francisco, CA, Tel: (800) 292-2582. 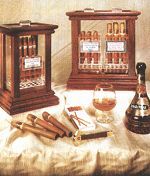 The CigarMarinador, from G. Williker's, Inc., marinates cigars in various liqueurs through the company's patent-pending deflected evaporation process. Marinating cigars simply requires filling eight ounces of a favorite liqueur into the unit's liqueur basin and placing the cigars into the cigar rack. An interesting gift for any cigar enthusiast, it is available in a choice of dark walnut, natural oak, or black cherry mahogany, and is offered in two sizes; the Single Marinador or the Double Marinador. Suggested retail price is $349 and $499. G. Willikers, Sarasotsa, FL, Tel: (800) 240-8886. The Lampe Berger, made in Paris, is a tabletop ornament designed to remove odors and replace them with subtle, yet complicated scents. Part fragrance lamp, part air cleanser, part sculpture, the Lampe Berger is a small, decorative, fluid-filled globe that is fitted with a wick and a burner. The wick is lit and allowed to burn for two minutes. The flame is then blown out and the lamp goes to work absorbing unpleasant odors using catalytic stones and replacing them with one of the more than twenty distinctive fragrances that have been developed. Lampe Berger also offers a neutral scent for the ultimate in subtlety, as well as an insect repelling scent. The Lampe Berger is available in Contemporary, Traditional, and Prestige models; about 80 design options in all. Lampe Berger, Highland Park, NJ, Tel: (800) 321-0020. 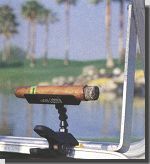 Colibri presents a gift set for the avid golfer and cigar aficionado. 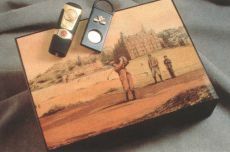 The set features an Italian cedar-lined humidor depicting a vintage Edinburgh golfing scene, and finished with a felt-padded bottom and brass hinges. 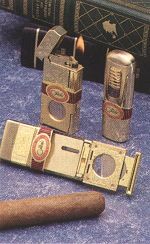 Also included is a green, matte-finished Prime Minister Cigar Lighter, which is enhanced with a golf ball-shaped ignition switch and a distinctive cigar band. The golf-design lighter is equipped with Colibri's Quantum Force V ignition system and a platinum grid which reignites the flame if blown out. In addition, the set also comes with a matching German-crafted, stainless-steel cutter, able to accommodate most popular ring sizes. Suggested retail price, $250. Colibri is making three of its most popular cigar lighters available in solid brass. The Churchill cigar cutter and lighter features a flint ignition system; the distinctive, dome-shaped Prime Minister provides the highly wind-resistant Quantum Force V ignition system; and the Quantum SST, accented in black, features a built-in cigar cutter and Quantum ignition system. All are made with durable, scratch-resistant brass finishes. Suggested retail price, $125. Colibri, Providence, RI, Tel: (800) 556-7354.